Been working on this over at FE.org and forgot to share over here. 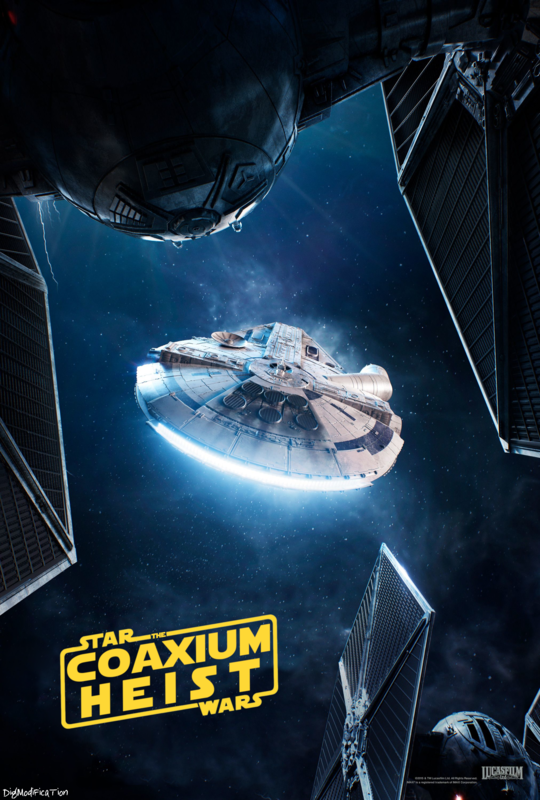 This movie looked like Star Wars but never really felt like it to me. Some of that lost feeling is due to a single uninterrupted narrative and the complete absence of one of Star Wars’ most iconic tools, wipe transitions. This edit will attempt to bring some of that Star Wars feeling back in and remove moments that are overly silly or ridiculous. I’d like to watch this without glancing at any sort of cutlist, going by the awesome title and fan editor! Your Rogue One edit was nice, easily the best conservative cut I’ve seen of this movie. I still haven’t dared to watch Solo again (between this and TLJ in 4k, I always choose TLJ 😄), your cutlist seems to remove many of my problems with it (mainly L3 and most of the silly prequelism). I am also very interested in seeing this because of the editor in question and the amount of L3 cuts. If I may ask, was there ever a thought to do something about Han speaking Shyriiwook (or is that even possible)? Personally I could definitely live without ever hearing that part again, haha. But the amount of L3 cuts in the list really brings me joy. If I may ask, was there ever a thought to do something about Han speaking Shyriiwook (or is that even possible)? Personally I could definitely live without ever hearing that part again, haha. Personally, I think getting rid of the subtitles in that scene is helpful. You get everything through context just fine, and it removes the weird feeling of it being literally the only time in ten movies that Shyriiwook is subtitled. Plus that means you could cut out one or two instances of Han’s growling if you really want to. I’m curious in what you mean by “changing the hue of Proxima’s lair to a darker grey blue”. I remember it already being so dark you could barely see anything. I assume that means de-saturating the blue hue - it looked like a blacklight was on during that scene. I checked that scene, and yeah, I forgot how ridiculously saturated it is. Hello all. All subtitles will be removed in this edit. L3 is more comedic relief than protestor now. I can’t fault her arguments and think with some of the initial stuff in the cantina-ish place removed we can retain the humor without the blatant protestong undertones. L3 is almost like a bickering sister/best friend to Lando now, or so I’m hoping. The removal of L3 and Qi’ra’s girl talk scene does cause a slightly odd feeling in the extension to the Falcon flying through the cluster, but it’s kind of like the Falcon’s initial arrival at Yavin, which consists of long shots of the falcon in space and no dialogue. I think it will be fine though. I’ve been trying to figure out the best way to transition from the crawl to Corellia and found an HD cinematic shot of Battlefront II that I’ll post to see what you all think. Greatly appreciate your positive feedback and interest! I’m actually beginning to see a gem in this movie that I at first didn’t like at all. I think with this edit I might even like it as much as TFA. This is exciting! I love what you did with Rogue One and was hoping you would work your magic on Solo at some point. Any chance you’d consider keeping the Maul cameo? I understand that it’s quite unnecessary, and potentially confusing for some, but it was the one scene in Solo that got my nerd juices flowing full force. Seeing the PT and OT come together was awesome. Maybe I won’t miss it after you improve the rest of the film, but I know it’s a highlight for a lot of people (in my circles at least). Color correction will be happening. My main focus, at the moment, I’d to remove the blue tint. I’ve seen some edits go vibrant with colors, but those end up looking overly saturated to me. One struggle I’m finding is that to eliminate the blue, I’m needing to mute a fair amount of tones. This makes it feal almost grittier, which I kind if like. Increasing saturation reveals some blues again which I’m not keen on. General white balance to remove the blue to the film> secondary color correction for space scenes to remove the massive blue tint further. The sky is now very grey on Corellia, Mimban and the train heist. I grew up in cloudy weather and it looks pretty close to my eyes. Perhaps my eye for skin tones reveals that I’m a troglodyte who doesn’t see the sun resulting in none yellowy/orange skin. I’m really trying to push myself to tackle color correction on this film (currently the hangup on some other projects). It definitely is one of my next steps in skill building. I’ll try to post some screen shots later. this soinds interessting! looking forward to seeing it! Feel free to give feedback here or there. Thanks! 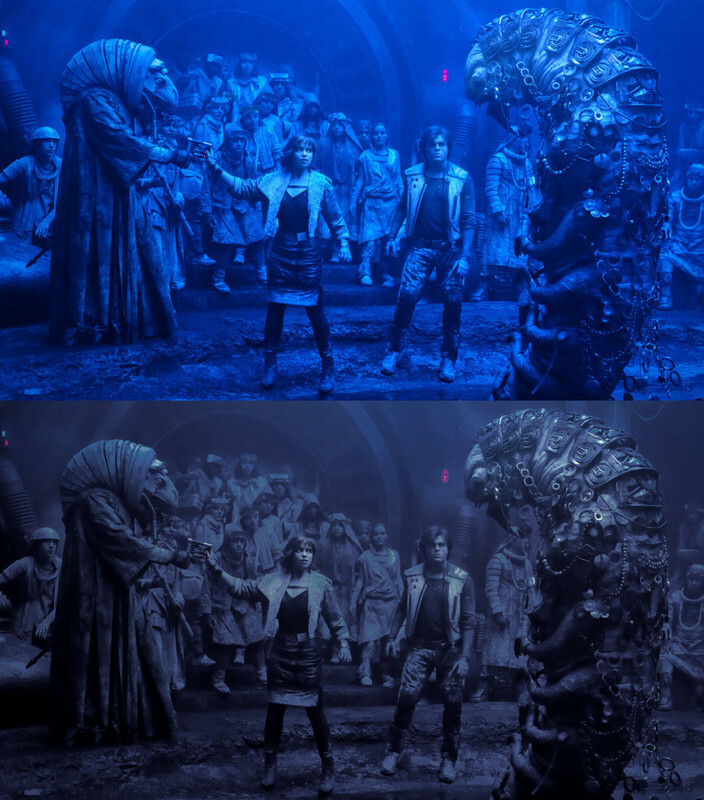 While a lot of people seem to be more focused on just brightening the film, your approach on the removal of the blue tint is really interesting. I didn’t notice just how “blue” the grade is until I looked at your comparison images. So you don’t really have any intention of increasing saturation or contrast, right? Just color correcting generally, possibly brightening a smudge? I like it. I think what you’re saying about the bleak grey skies comes across. Some of those shots, especially the train heist, feels on the edge of total desaturation/black & white. Which I like, because it kind of makes the existing color stand out more than it did with the blue tint thrown over everything. I guess the movie being bleak vs the colors popping really depends on taste. I think what you’ve done emphasizes the mood of that harsh reality, the life of crime under the brutal Imperial regime. Whereas a LUT that made the colors pop more might be leaning into that adventure film mood more. Even if you didn’t want the movie to be brighter or more colorful per se, I could see others using your grade as a solid basis since you have basically color corrected the film. I’m also not a color expert so this all just my random thoughts. I actually checked that one out, but the colors look hyper saturated to me. Maybe I live a dull life, but colors aren’t so vibrant to my eyes.